The season of Spring brings freshness, brightness, and crispness into our lives, much like the New Zealand Spring Lamb recipes below! Whether your family celebrates Easter with a lunch, brunch, or dinner, these dishes are sure to delight your guests. With recipes including Stuffed Lamb Leg with Figs and Prosciutto, Rack of Lamb with Crumb Crust, and the Simplest Roast Ever, you’re sure to earn even more admiration from your guests when you use these ideas for your Easter holiday menu. 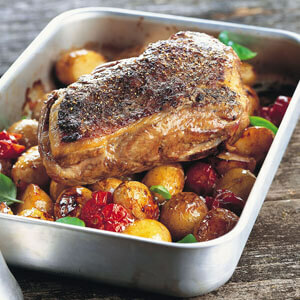 This elegant dish featuring the New Zealand Spring Lamb’s lamb leg is extremely tender, juicy, and sinfully aromatic. 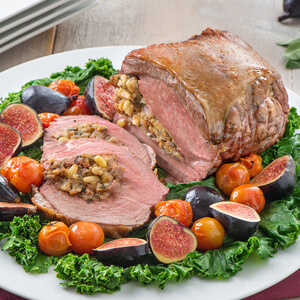 Its freshly prepared fig, prosciutto, and sage filling is a tasty complement to our roasted lamb leg, and it looks equally appealing on the plate! This main lamb leg dish is best served with a classic or earthy mushroom risotto or honey-glazed carrots. 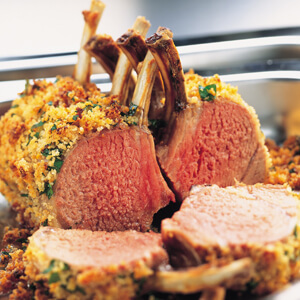 New Zealand Spring Lamb’s rack of lamb is the perfect show stopper when it comes to Easter dinner. This impressive dish is surprisingly simple to make and is ready in under 30 minutes! The easy preparation of this meal gives you plenty of extra time to focus on your other delicious menu items, like basil mashed potatoes or cranberry glazed baby carrots. This roasted New Zealand Spring Lamb’s lamb shoulder glazed with a mixture of anchovy paste, garlic and black pepper; adds a fragrant and salty twist on a classic dish. We’ve roasted the lamb on top of tomatoes and potatoes here but if you prefer your vegetables to be on the crispier side, feel free to roast them in a separate pan. Even though you have your meat and potatoes covered, we suggest taking this dish one step tastier and prepare some simple roasted asparagus to accompany the other stars on the plate. These festive Easter (or Passover) dinner recipes are just the thing to brighten up your holiday celebration. Family and friends will enjoy feasting on these delightfully fresh dishes that even the Easter Bunny won’t be able to resist!